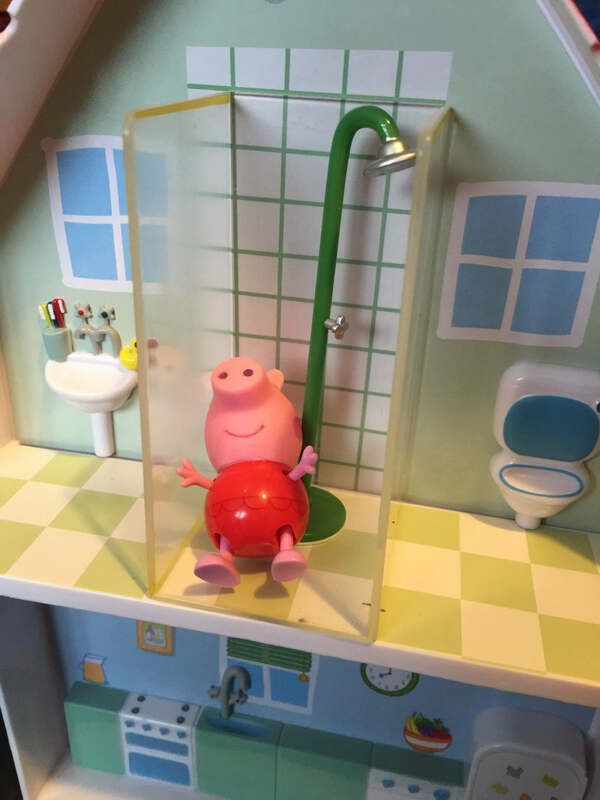 Do your children like Peppa Pig? With a 3 and a 4 year old it’s safe to say we watch a lot of episodes of Peppa Peppa. My 3 year old wears Peppa Pig clothes, cuddles an assortment of Peppa Pig toys in bed and loves setting up her own little Peppa land with all her toys. 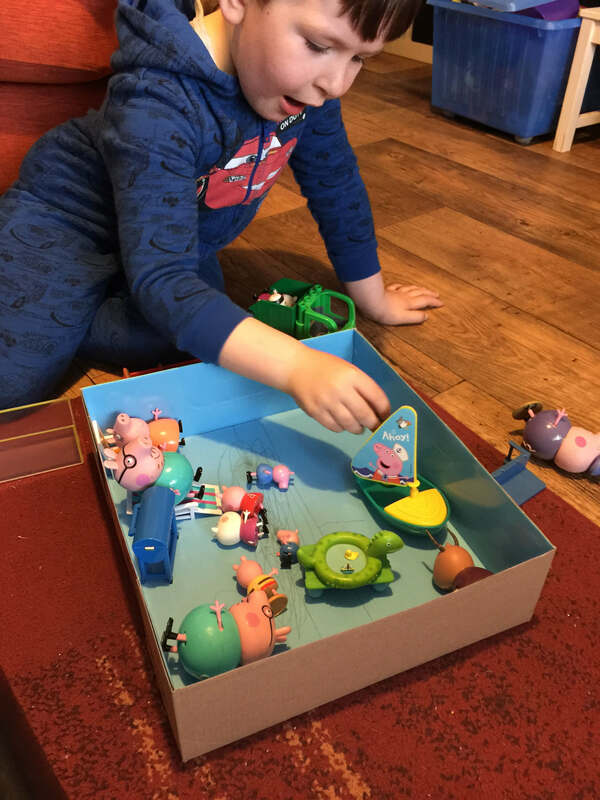 She has quite a collection and was recently sent the Peppa Pig Holiday Time Sunshine Villa from Character Online to review. Peppa and George are in the holiday villa! Open up the playset and play with George in the paddling pool! There’s lots of holiday accessories and furniture for holiday fun. Also includes a carry handle and packs away for easy storage. The children enjoyed opening the toy which includes the Villa with carry handle, stairs, bunkbed with ladder, shower with cubicle, BBQ, table with sun umbrella, paddling pool, deck chair, sun lounger and inflatable. A Peppa Pig and George figure wearing swimming costumes are also included. The toys were easy enough to get out of the packaging and the children were even able to recycle the blue cardboard packaging into a swimming pool for the new toys! The house contains four rooms, decorated as a bathroom, bedroom, kitchen and room overlooking the swimming pool. 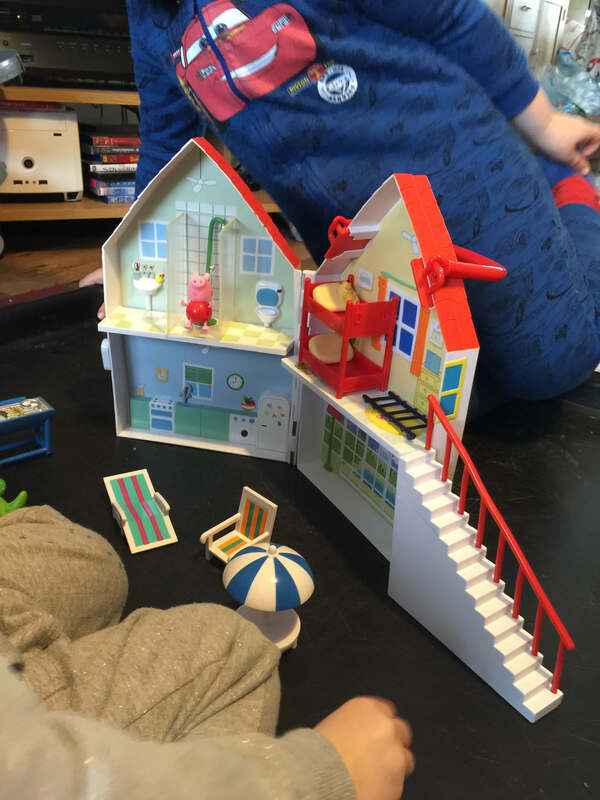 They were happy to play with the Peppa Pig Holiday Time Sunshine Villa on its own but soon wanted to get their other Peppa toys out. We already have some lovely Peppa Pig toys and this set compliments them beautifully. We have a similar Peppa Pig house and road so Peppa Land was soon established in our Tuff Spot and all Peppa’s friends were brought out to play. This playset retails at around £29.99 and I think that represents good value due to the number of accessories that come with the villa. We like the holiday theme and the fact that Peppa and George are dressed in their swimming costumes. The carry handle is really handy and some of the toys can be packed away inside the house so it can be tidied away or perhaps taken away with you. We all loved the stairs, which finally solves the problem of how Peppa and her friends can go upstairs. The playset is aimed at children aged 3+. Great review! You went into great detail on the toys and quality. I don’t have children but I work in a school and these posts really help with finding suitable toys to have in.